Sulzer is delivering service and product excellence through innovation at ACHEMA 2018, to be held in Frankfurt from June 11th to 15th. The exhibition will bring together experts from across the world and Sulzer is taking the opportunity to demonstrate its expertise in separation technology for chemical manufacturers, pump design and rotating equipment services. ACHEMA is the leading chemical and process engineering exhibition that creates a forum for the exchange of ideas and new technology. Sulzer will be offering three chances to discover the latest developments in separation and mixing solutions, pumping technology and rotating equipment services. Sulzer’s experts in separation technology will be on hand in Hall 4.0, Stand D48 to discuss the latest developments in tray technology, random packing applications, skid mounted separation solutions and the use of carbon products in column internals. Sulzer Chemtech is the market leader for separation and mixing technology and the recent introduction of MellaCarbon™ column internals has delivered considerable advantages for corrosive applications. Decades of experience in the design and construction of tailor-made components ensure optimum column performance for the chemical manufacturing sector. Further developments have been made in tray performance with increased capacity and improved downcomer technology that enhances performance. In addition, experts on the stand will be able to provide a detailed explanation about improvements to random packing applications and Sulzer’s NeXRing™ solution. Integration of the latest technology with existing infrastructure is very important and Sulzer offers a turn-key service using skid-mounted solutions that minimize costs and disruption on site. By delivering a fully tested, tailor-made solution, Sulzer ensures maximum benefits with short delivery times. In Hall 8.0, Stand A71 Sulzer offers an insight into the latest designs as well as developments in asset management and pump optimization software. One of the latest additions to the product lineup is the heavy duty axial flow, Ensival Moret CAHR pump range which is ideal for applications involving highly corrosive liquids and slurries. Another product on show will be the OCV range, the latest evolution of the proven API 610 type VS4 pumps that offer reliable performance in demanding applications. In addition to this, Sulzer will also have the OHV pump, the Type OH3 overhung, horizontal, centerline-mounted, single stage pump that is API 610 certified and ideal for use in chemical manufacturing. Moving from individual pumps to larger pumping installations, it is important to monitor overall performance as well as data from specific assets. Sulzer’s BLUE BOX is a flexible and secure software solution that uses existing operational data combined with Sulzer’s expertise in pump design to analyze pump operation and optimize it in terms of performance, efficiency and reliability. By providing quantitative information, customers can make fact-driven decisions regarding their asset investment and take targeted actions on the right asset at the right time – a true data-to-value process. Sulzer is a leader for rotating equipment services with a worldwide network of service centers, supported by design, manufacturing and engineering facilities that can offer turnkey solutions for the chemical manufacturing sector. Visitors to Stand A71 in Hall 8.0 will also be able to see and discuss the company’s comprehensive offering in the maintenance of turbines, compressors, pumps, generators and large motors. 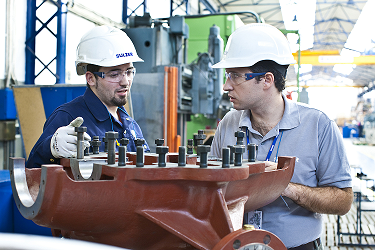 Together with experienced field service teams, Sulzer’s expert engineers and designers offer comprehensive solutions that include preventative maintenance and reverse engineering of new parts. Delivering a flexible and high quality service, Sulzer can extend the operational life as well as improve the efficiency and reliability of important assets to minimize and downtime and boost productivity. For more information and to discover the latest in separation and mixing technology visit Hall 4.0, Stand D48 as well as the experts in pump and rotating equipment services, Hall 8.0, Stand A71.